George “Geordie” Roberts is excited to be returning to the Choir after a 15-year hiatus into post-secondary teaching. A graduate of the UBC School of Music and the Vancouver Academy of Music, Geordie has close to 50 years of choral experience under his belt, and he’s not finished yet! 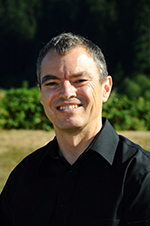 A home-grown BC musician, he has been the Co-ordinator of Music at Highlands United, North Vancouver since 1992. His musical life includes teaching, accompanying, composing and arranging, facilitating voice and choral workshops, adjudication and the occasional solo recital from time to time. Geordie makes his home in North Vancouver with his wife Frances and an ever-changing number of resident sons: Aidan, Garreth and Liam. Yes, they all sing well.